I am a sucker for a dress. The more completely extravagant, over-the-top, not really suited to any real-world situation a dress is, the more it appeals to my outlandish sense of taste. I’m also very inspired by vintage. Whilst being aware of the questionable gender expectations around certain past fashions, we now live in the 21st century, I can wear them on my own terms, and they make me feel fabulous. An exhibition, then, of “Fashion & Photos from the 1950s” should be right up my street. Why, then did Model Image leave me feeling so disappointed? The problem is that it doesn’t deliver enough, and this is mostly because it’s trying to do too much at once. For example, one approach it tried to take to exploring the era is looking at the career of local model June Duncan. In principle, this is a great jumping-off point for exploring the fashion of the era. 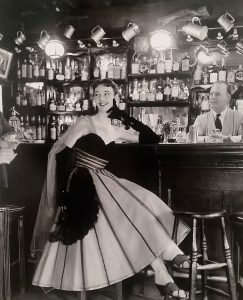 Duncan was clearly a Big Deal; a large photograph shows her position as one of the top ten British models of 1952. She worked with major fashion houses in London and Paris. But oddly enough, her modelling career barely feels like the focus here. Instead, the wall space used to tell her story is more than half taken up with images of her as a child dancer, teenage actors, wartime member of the WRENS. And I found myself just not caring about this. Maybe doing ballet aged 6 did give her the grace and poise required for modelling, but this isn’t really the story told. If you’re going to create a show about fashion, focus on the fashion. But we’re left with just a handful of photos which frustratingly point to a much bigger picture which isn’t explored here. As for the fashion that’s on show…well, I can’t deny that some of it is pretty. But why is it all ball gowns? Not only that, but ball gowns which are all pretty damn similar in terms of design. As I mentioned previously, I’m a bit of a vintage fan, and I spent a lot of time in my late-teens/early 20s researching the looks of different eras. There was a lot more going on in terms of 1950s fashion that’s on show here – we don’t even get any swing skirts! And so once again, I feel like Model Image hasn’t delivered on what was promised. I’ve thought hard about what I think has actually gone on here, and come to a couple of conclusions. 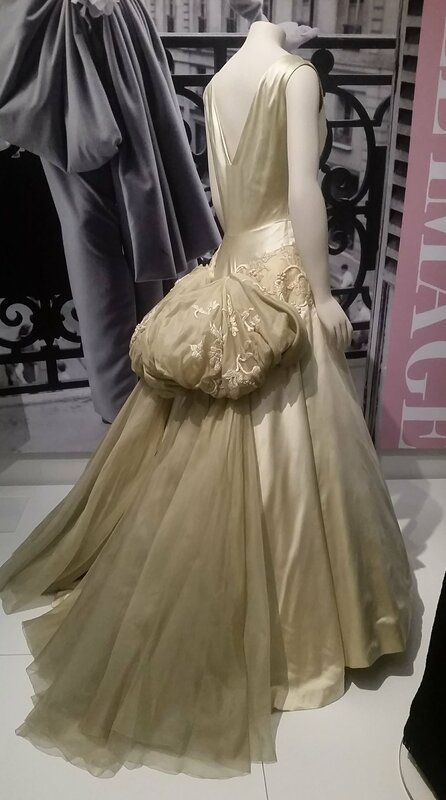 The dresses is the easiest one: most of the dresses on display here were commercially available in Liverpool. So maybe they were aiming to look at how fashion was translated into clothing for the masses? Fine. For me that still doesn’t excuse the lack of diversity, but I can tease out a message. But the biggest influence, I believe, is demographic. On my Monday early-afternoon visit, I was the youngest visitor by about 20 years – and one of the few not recalling “how things used to be”. This justified the coverage of Duncan’s childhood and war years – the audience they expect will directly relate to these pictures. And from there, they can jump off into a state of romanticism. Of course everyone went from the war to a modelling career in Paris! That was the way things were! This show is less interested in being a comprehensive look at the era as an exercise in rose-tinted reminiscence. It’s for anyone who has ever looked at how the younger generations dress and complained about the lack of class and elegance. It explains the particular choices of ball gowns, too – the ultimate in elegance. Never mind that actually us younger generations still often take pride in looking fabulous, never mind that the particular rules of elegance cemented women’s place as objects of the male gaze. And actually, I didn’t necessarily want or expect Model Image to answer these questions. I just expected it to be so much more than an exercise in wish-fulfilment. This entry was posted in Current exhibitions, Exhibitions, Home and tagged 1950s, art, fashion, Liverpool. Bookmark the permalink.